With Pawan Kalyan moving to politics and not signing up any films, there are no filmy updates on his Birthday disappointing the Mega fans. But here's some rejoice to fans as Ram Charan's film teaser might be out as a gift to all Mega Fans on Power Star's Birthday. 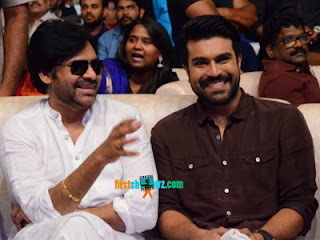 The teaser trailer of Ram Charan new film under direction of Boyapati Srinu is likely to be released on September 2 on Pawan Kalyan's birthday. This Boyapati directorial is touted to be a high-voltage action entertainer and the teaser would be perfect Birthday treat for fans. After blockbusters like Dhruva and Rangasthalam, Ram Charan has opted for this commercial mass entertainer to satisfy his mass fan base. Kiara Advani is the heroine. DVV Danayya is producing the movie under DVV Entertainments banner.